Hey meatbag! Buy this comic or back off! "The A-Team" is the twenty-third comic issue, which was released 2 February, 2006 in the US. Bender takes over the ship and makes a donut causing a vortex, which begins to pull the crew in, they manage to escape using the power from light support. Another Planet Express ship emerges and its crew teleports onboard. The other crew are look-alikes of the main crew and are called Shelia, Sly and Mender who accidentally created a vortex and were sucked in. During their time in an uninhabited dimension the crew read, exercised, repaired the ship and cloned a better Zoidberg. When the Professor sees the other crew he is thrilled, because they are the only decent crew the company has had. Hermes fires Fry, Bender and Leela, takes their career chips and forces them to wear Non Person shirts which means everyone has to pretend they don’t exist. The crew has the time of their lives since they can’t get in trouble and the cops can’t arrest them. However they prefer their old lives and decide to try and get them back. The crew takes off their shirts and the cops banish them to the fandom zone where fans can’t stalk celebrities. If they concentrate the crew will be able to see the real world but the real world can’t see them. Only Mender can see them and reveals that the rest of his crew are holograms since he killed the real crew. 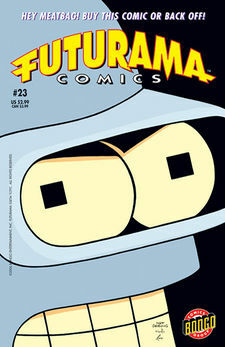 Leela gets an idea to download Bender’s mind into his spare body, then use a device to bring the rest of the crew to reality. Mender teleports to his ship and escapes but is followed by the crew. Bender tricks Mender into creating strong donut/vortex, which pulls him in. The crew is about to get sucked in but use Bender’s jealousy of Mender to escape. Bender then decides that Mender is actually a role model for robots. Zoidberg wasn’t fired despite there being a better clone. Possibly because, unlike the old crewmembers, the clone did not have a Planet Express career chip. Though most likely coincidental, the Professor is seen to have injured his back in the same way it was for most of "Bendless Love", Hermes and Zoidberg have the same injury. Silver Surfer is again almost hit by the Planet Express Ship, he was previously seen in US#002. The title is a reference to the TV show with the same name. The crew should still have their other career chips, which they had put back in during "The Cryonic Woman". Leela is able to shake Sheila’s hand despite her being a hologram. However it is possible these holograms are solid. When Bender interrupts the evening news he isn’t wearing his "Non Person" shirt. Also, it isn’t possible for Bender to reach the TV studio that fast, since it is located at Los Angeles, not New New York. This page was last edited on 27 January 2015, at 22:21.